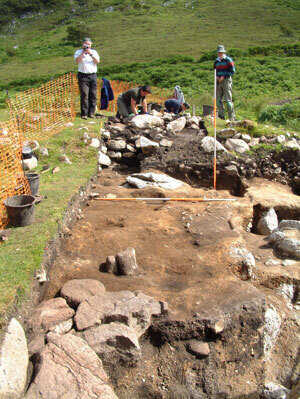 Read on for the latest developments from the High Pastures site and news of planned Open Days during Highland Archaeology Week in October 2005. The dry weather conditions of the past two weeks have provided ideal conditions for the continuing excavations at the High Pastures site, and work in Trenches 2 and 3 has been completed for the 2005 season. Plans and sections have been drawn in Trench 3, while a quite unusual and potentially exciting piece of limestone has been recovered from a low revetment wall in the base of the trench. Details of this object can be found in the (Latest Finds Page). Excavation of context C208 in the northern half of Trench 2 has continued to uncover some important and unusual features, along with a few small finds. 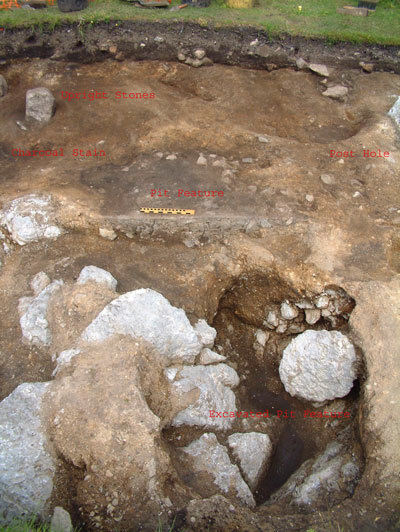 A small area of ‘micro-paving’ was exposed at the east end of Trench 2, which appears to be running under the low stone wall here (see image below). Several artefacts were recovered during the removal of context C208 including two pebble grinding tools, a fragment of a rotary quern stone (upper stone) and a fragment of a stone crucible or mould (see ‘Latest Finds’ page for details). 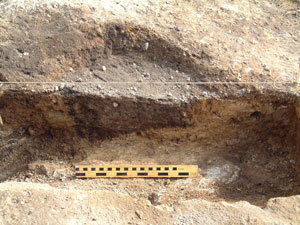 As the remainder of the dark charcoal-rich sediments of C208 was removed to uncover the yellow-coloured karstic sub-soil below other features became apparent. 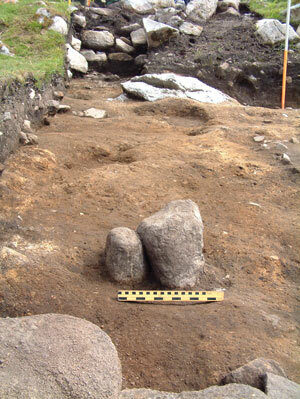 These included a possible post-hole, a pit feature, a dark charcoal-rich stain and two upright granite stones. After recording we sectioned these features to investigate their profiles and sample the contents of the fill within them. 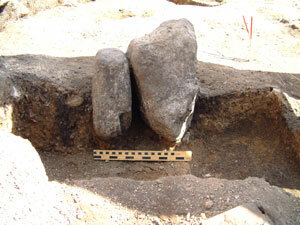 Adjacent to the stone setting was an area of charcoal staining on the surface of the karstic sub-soil. 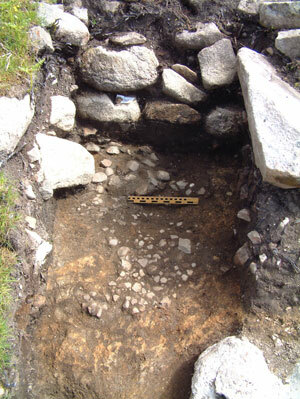 This feature was also sectioned to reveal a small pit feature filled with charcoal lumps, a few fragments of calcined bone and peat ash deposits. It is difficult at this stage to attempt to interpret the function of some of these features. However, charcoal fragments recovered from the fill of the features should allow us to obtain radiocarbon dates to determine their chronology, while sediment samples recovered may contain other material to shed light on their potential function. Although Trenches 2 and 3 have now been closed down for this year, Trench 5 has been opened to investigate the wall and underlying archaeological deposits at the east end of Trench 2. 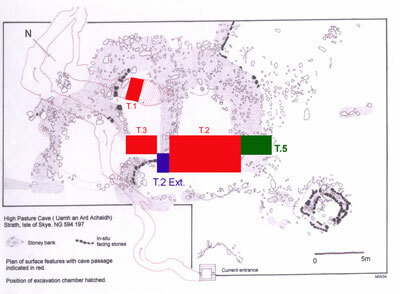 The plan above shows the location of trenches opened at the High Pastures site during 2004 and 2005 (with the exception of Trench 4 which lies approximately 25 metres to the east of Trench 5), including Trench 5. 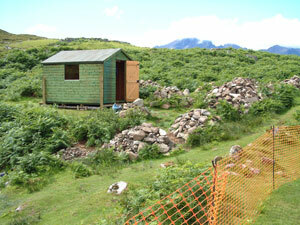 Other developments at the site during the past week include the supply of a new site hut from Jans of Portree, which has been erected on a flat platform to the southwest of the cave entrance. 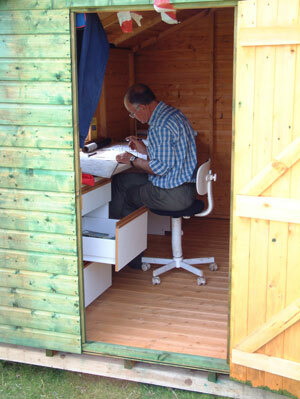 The original site shed will also be moved to the same location when we have the manpower on site to assist with the lift. The new hut will house the monitor for the cctv cameras (that will be located in the cave passages below) and additional displays, especially during the proposed Open Days in October of this year. Excavation work will be resumed in Bone Passage within the cave next week, to investigate the rich and diverse archaeological deposits identified in 2004. Unfortunately, due to our excavations in Trench 2 failing to find the entrance into the cave we shall be accessing Bone Passage through the present entrance. This will involve the long and sustained movement of material through the stream passage to the surface for wet-sieving. 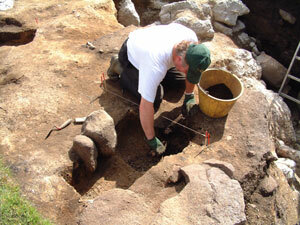 However, this burden should be amply rewarded by the recovery of some interesting archaeological deposits. Keep visiting the website for updates on this work. Finally, as mentioned briefly above we shall be holding Open Days at the High Pastures site between the 5th and 12th October (inclusive). There will be oportunities for guided tours of the site and the surrounding archaeological landscape, while poster boards and PowerPoint displays will provide details of the archaeological fieldwork carried out on site so far. CCTV camera equipment located in Bone Passage will convey live pictures of excavation work to the surface, while you will also have the chance to try you hand at wet-sieving and sorting of archaeological residues. We also hope to set up a variety of archaeological experimental areas including flint knapping, bone and antler working, and the preparation of iron ore deposits for smelting experiments, that will be carried out in 2006. Therefore, there should be something of interest for all age groups and we would be most grateful for your support for this important project.